David Butler on 'screen adaptations' from Frame It Productions on Vimeo. David Butler on 'characters' from Frame It Productions on Vimeo. David Butler 'Good characters or evil villains' from Frame It Productions on Vimeo. 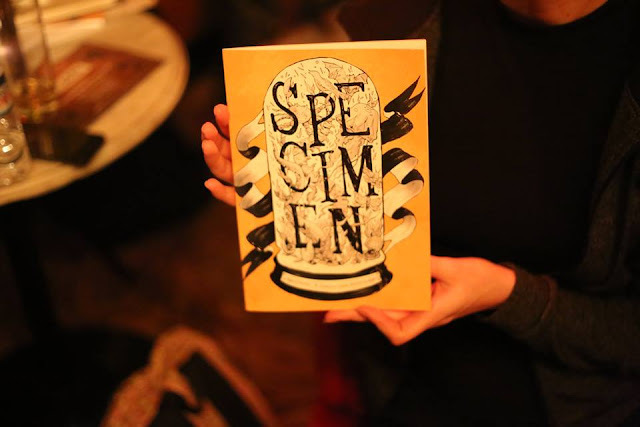 Specimen: A Comics Lab Anthology. I'm absolutely delighted to have a short two page comic with the latest The Comics Lab Anthology "SPECIMEN"". There are some amazing artists and writers included. Thanks a mill for Stephen Ward for his honest, and thankfully positive review of my story on getting "THE SNIP". I had a playful attempt at some unscripted structure and very loose drawing style. It was also inspired by the Repeal the 8th campaign. Thanks also to Irish Comic News for supporting Irish Comics. David Butler writes and illustrates (and over-shares!) in “Vasectomy Operation”. I honestly expected to spend my time reading with my legs crossed. It’s a credit to Butlers dialogue that I actually spent the time laughing at how the story unfolded. Make no mistake, it’s still a story about getting the snip. But thankfully with Butlers jovial dialogue, it’s a lot less painful than you would have expected. 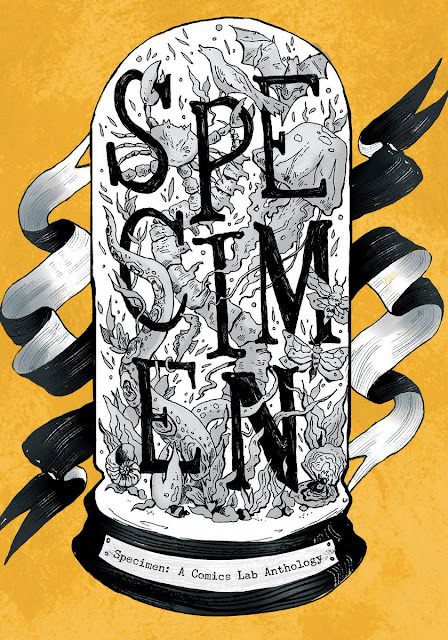 Specimen is the second anthology from the Comics Lab. For those unfamiliar with the Comics Lab, it’s “an informal meet-up whose aim is to explore sequential story-telling, to generate platforms for comics made by its members and to stimulate a vibrant comics community in Dublin and Ireland. Founded by Sarah Bowie, Debbie Jenkinson and Paddy Lynch in May 2015.” (from the introduction of Specimen). The anthology was designed by Dearbhla Kelly (who was also the project manager of the anthology). I like the choice of ‘Specimen’ as the theme of the anthology. The book itself is a specimen of the Irish comic scene, featuring thirty two contributors in total. You could also consider each story is a specimen of how to tell a story in comic format, be it abstract, comedic, sci-fi, dark humour etc. It’s also great to see some familiar name from the small-press mixed in with some new names. Anthologies willing to give an opportunity to a creator to get their first strips out there can only help grow the Irish comic scene. The first story is “Marianne North’s Last Discovery” by Olly Blake. The story follow the titular artist as she sails up a great river into the jungle in search of a flower she wished to capture in a painting. The strip itself had a Matt Kindt kinda vibe to it, both in terms of the art style and how the story unfolds. As someone who greatly enjoys the work of Kindt this meant the anthology was off to a flying start. “True Love” is a bitter sweet story written by Jared Williamson and illustrated by Ashwin Chacko. It’s a well written story and I liked Chackos artwork, particularly an unusual detail on the faces of the characters. One thing that I felt could have done will a bit more polish was the lettering. Some of the lettering had one sentence with a nice bit of spacing between words and the following sentence looked like it was just rammed in. It meant that some words actually read a single word. It didn’t diminish the strip, just something for the letter to watch out for in future strips. Barry Keegan provides the next strip, “Specimen”. A somewhat humorous short about what might end up in fast food. The strip is entirely wordless so the reader has to rely on the art to follow the story. Keegan does a good job leading the reader through the panels with each panel having enough visual information in it to keep the reader informed. Art from “Specimen” by David Ferguson and Brian Burke. Another strip titled “Specimen” follows. This one is written by (yes, ICNs very own!) David Ferguson and illustrated by Brian Burke. The strip is a sci-fi story of the last human survivor who is taken aboard an alien ship. The crew of the alien ship are attempting to save the human race which is why they’ve taken the human onto their ship. Burke does a good job with the art, though I would have liked some solid blacks in the first panel to make the space ships really pop. It was great to see Ferguson get his first strip out into the world. A really fun strip by Ferguson and Burke. Worth it for the last panel! “For love of the game” is written by Aaron Fever, illustrated by Katie Fleming and lettered by Zakk Saam. The strip is the story of the two worlds of professional footballer Jose Hernandez. The first page is of the dying minutes of the last match of the season and immediately after. The following pages is what happens after Hernandez leaves the stadium. I loved how this comic was put together. Each page of the pages could be two individual strips so the transition of the story from the first to the second page is even more pronounced. It was a really good idea by the creative team. Equally having the first page really busy compared to the second. The strip sneaked up on me. I read it a couple of times but it didn’t click immediately how the two pages were being used. But when the penny dropped did I have a big smile on my face. Anthea West provides the next strip to be titled “Specimen”. This strip sees West provide one of her creepy/spooky stories. I’m always impressed with how well she does these types of stories since I’m generally reading more fun/light stuff for here, like Fate for example. Honestly, how can someone creep you out with a story of a kid reflecting of the replacing of carpet with floorboards?? Read the strip and find out! Claire Duggan provides the next offering with her “Propagate” strip. It’s a wordless sci-fi story. I don’t think I’ve seen Duggan do a comic strip before but this strip is beautifully illustrated. Some great choices of panels that tells a love story. I very much hope we’ll be seeing more artwork from Duggan soon. “Mysteries of My Life no.17“ is written and illustrated by one of the Comics Lab founders, Debbie Jenkinson. It’s a funny strip based on a random assortment of items stolen from her home when she was a small child. When you see the items and how it’s actually made into a punchline you should get a good laugh out of it. If not, then the thieves probably stole your funny bone in addition to the items of the Jenkinson Heist! Conor Tulloch writes and illustrates the strip “Accession”. An interesting short about a scientist and what happens when the specimen gets out of control. I liked the idea in the story and the artwork too. It’s quite close to the type of stories that can work well as a Future Shock in 2000AD. “The Hunt” is written and illustrated by Karen Harte. This is another strip that doesn’t end how you expect when you start it. And it’s all the better a strip for it. The artwork really works for this strip. The story is a fun one so it’s only right to have a fun and energetic art style to amplify the fun sensibility of the story. Julie Nick gives us a preview of “Fighting Time” from Julie Nick’s Pulp Stories. A woman faces off against a mysterious group who have taken control of a train and loaded it up with explosives. It’s an action packed preview that will have you wanting to find out how the story plays out. Art from “Marbhlight” by Bebhinn McInerney and Dearbhla Kelly. “Marbhlight” by Bebhinn McInerney and Dearbhla Kelly follows the story of a young woman who cycles into the local town to pick up some groceries. As she shops she catches bits of conversation about some tragic happening about a young boy. The dialogue and art really draws the reader in. The story leaves the reader with more questions than answers, but in the way a good puzzle piques your curiosity. Clare Foley writes and illustrates “Contaminant”, a sci-fi short that follows two stories. I very much enjoyed this as I didn’t see the ending coming. Another good example of pulling in the reader by not revealing anything about how the two stories relate to each other. The reader just has to read on if they want an answer. “Trails” written and illustrated by Dermot Hegarty was a trickier story to wrap my head around. It seems to be a story about spending so much time with our faces in a smartphone on various apps. At least that’s the sensation that the heavy use of birds-eye views of the character(s) gave me. I almost felt like I was looking down into my smartphone. It’s a somewhat ambiguous strip (especially due to it having no captions or dialogue), but that only lead to me reading it again and again to try figure it out. John Corrigan writes and illustrates “The Pacifist”, a strip which tells the story of Francis Sheehy-Skeffington. He was a pacifist that lived around the time of the Easter Rising. Knowing nothing about the man I found this strip to be quite interesting. It gives a good sense of the man and might lead some readers searching out more information on the man. It’s a good example of how a comic can be used to tell people about historical people or events. “A Tear In Jean” is written and illustrated by Leeann Hamilton. It’s a silent strip with some excellent illustration by Hamilton. It sees an astronaut meet an archer in an opening in a forest. The astronaut is clearly searching for something and seeks assistance from the archer. The ending suggests that the strip could possibly be part of a larger story. I hope that this is the case as I’m curious about the complete story of the astronaut and archer. And the art’s nice to look at. “Specimen” by Katherine Foyle is set in a park where a mother with a stroller and a young son meet a friend of the mother. The story is one of those moments that many kids have while their parent is chatting to a friend. The kid starts to take notice of whats around them. Which leads them to having a “did I really just see that happen?” moment. The art suits the story and I liked how there are no borders on each of the panels. The art just seems to end. Almost like it was a series of photographs on a page. Next up we have the horror short, “Drip”, written by John Ward and illustrated by Kurt Krol. Alice is home minding her younger brother while her parents are out for the night. Considering that it’s only a two page short, the comic does a pretty job of building up some tension. Katie Fleming writes and illustrates “Places”. A short that brings the reader through various places as seen by the sleeping person in the first panel. Places that seem ordinary, to more exotic places and even to some fantastical places. The story is almost totally wordless so the art has to convey he sense of the various places. Which it does rather well. Also, I want a comic about the second place in the sequence of places! “A Specimen of Womanimal” by All Things Thom is a funny and odd comic. It’s another new name discovered in this anthology and I’ll be taking a look at more of his stuff as I enjoyed the strange sense of humour displayed in this comic. “Shush” by Marianna Mooney moves into a darker looking comic story. The artwork really gives this story a claustrophobic feel, which is somewhat amplified by the use of a single sound effect throughout the strip.